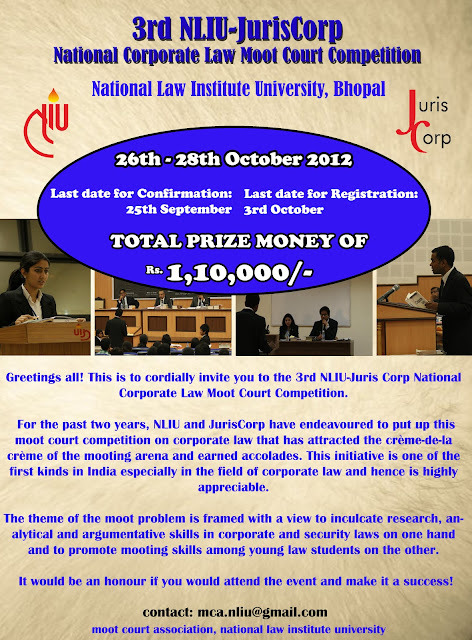 The 3rd edition of the NLIU-Juris Corp National Corporate Moot Court Competition, 2012 is here. This is an open announcement for all colleges who may have not received the invite through mail. Do register yourself by sending a mail to mca.nliu@gmail.com. The dates for the competition are 26th-28th October, 2012. The last date for registration of team is 25th September, 2012. The last date by which the hard copy of the registration form has to reach the organizers by 2nd October, 2012. The last date for sending clarifications regarding the problem is 2nd October, 2012. The last date for submission of softcopies of the memorial is 20th October 2012. The teams have to submit 6 copies each, of the memorials from both sides on 26th October, 2012. Date for Researcher's Test: 26th October, 2012. You may refer to the Rules of the competition for further details. The rules can be accessed here. **Minor changes, if any, in the rules will be put up on this blog and the registered participants will be dully notified. The Fact-sheet for the problem can be accessed here. We extend a very warm invitation on behalf of Juris Corp, Advocates & Solicitors and the entire National Law Institute University fraternity. The Moot Proposition as well as the Rules & Regulations shall be released shortly. The information regarding the same shall be available on the NLIU website (www.nliu.ac.in) as well as the MCA blog (http://www.nliu-mca.blogspot.com/). National Law Institute University-Bhopal (NLIU) will be hosting the Surana & Surana North India Rounds of the Stetson International Environmental Law Moot Court Competition from 30th November to 2nd December 2012. The teams from Arunachal Pradesh, Assam, Bihar, Chattisgarh, Delhi, Gujarat, Haryana, Himachal Pradesh, Jammu & Kashmir, Jharkhand, Madhya Pradesh, Manipur, Nagaland, Odisha, Punjab, Rajasthan, Uttar Pradesh, West Bengal & National Law University Odisha, Cuttack shall be eligible to participtate in the North Rounds. The top 10 ranks comprise of the main pool and ranks 11th and 12th comprise the buffer pool. The Main Pool comprises of the first 20 ranks and the Buffer Pool comprises of ranks 21-24.